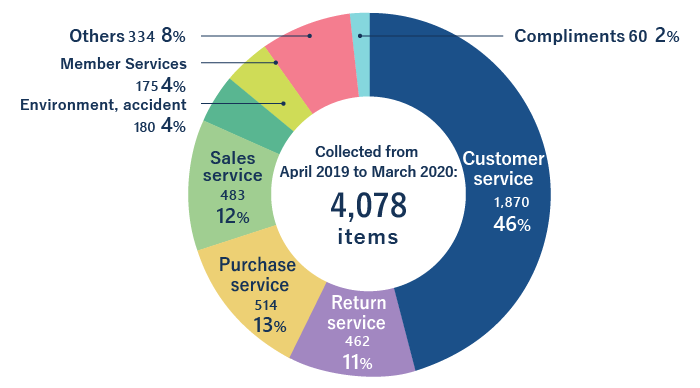 We aim to be an intermediary point in the product cycle, where products that customers no longer need can be passed on to customers who require them. We therefore strive to be a company that customers can continue to trust. The BOOKOFF Group has set up “Customer Contact Center” to receive various inquiries from customers by telephone or email. To maintain and enhance service levels, opinions collected at the contact center are passed on to all stores and the head office via our intranet. This sharing of information and awareness will lead to our improvement. 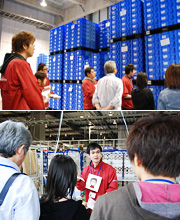 We have held tours of the BOOKOFF Online warehouse in Yokohama, Kanagawa Prefecture, as a way to alleviate the concerns of customers purchasing or selling used items via the internet. The tour allows customers to see the entire process, from receiving and inspecting items arriving from customers wishing to sell, our quality and inspection structure for items to be sold to customers, to packaging and shipping. The tour has received a lot of positive feedback.